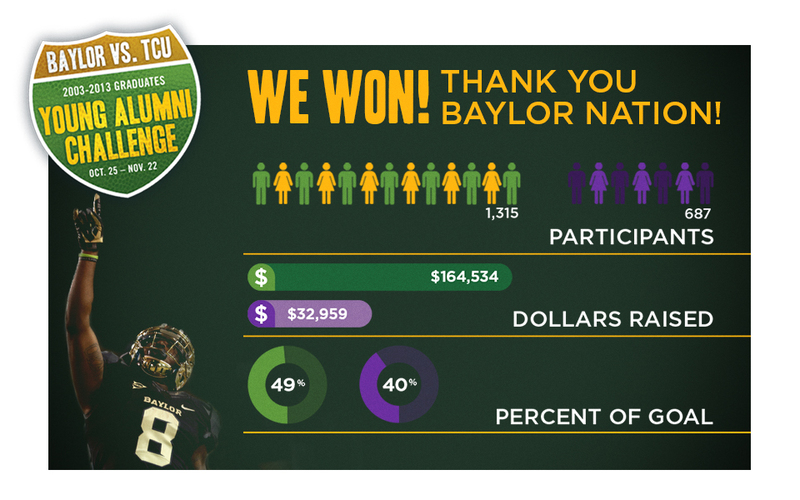 After four weeks of head-to-head competition in alumni giving, Baylor University young alumni proved successful in the inaugural Baylor vs. TCU Young Alumni Challenge. At the final count, 1,315 Baylor young alumni made gifts to the University totaling more than $164,500. Dubbed the I-35 Battle Royale, the young alumni giving competition began Oct. 25 and ended Nov. 22, capitalizing on the historic rivalry between Baylor and TCU that began in 1899 when both universities were located in Waco. Each university's young alumni--graduates between 2003 and 2013--were challenged to make a gift to any area of their respective university during the month leading up to the Nov. 30 TCU vs. Baylor football game, the 109th face-off between the schools. The university closest to reaching 10 percent participation by young alumni during the competition period earned bragging rights. Baylor reached 49 percent of the participation goal, and TCU reached 40 percent. In addition, 576 young alumni made financial gifts to Baylor for the first time. Plans are underway for the young alumni competition to lead up to the football game between these historic rivals each year. Baylor alumni are encouraged to visit baylor.edu/alumni/directory to update their information to ensure they receive details about next year's challenge. Final results of this year's competition can be found at baylor.edu/battleroyale.